Today’s guest is Julie de Azevedo Hanks, PhD, LCSW is a licensed clinical social worker and psychotherapist specializing in women’s emotional health and relationships. Dr. Hanks is the founder and director of Wasatch Family Therapy, author of The Burnout Cure and The Assertiveness Guide for Women, a blogger, a local and national media contributor, an online influencer, a consultant, and an award-winning performing songwriter. A native Californian, Hanks currently lives in Salt Lake City, UT with her husband and their 4 children. She enjoys spending time with family and friends, taking naps, reading, writing, eating a lot of chocolate. 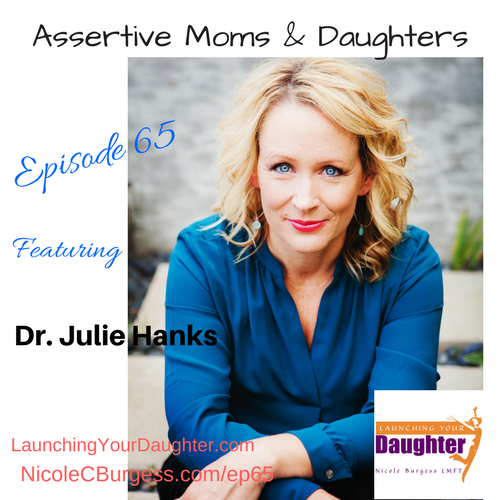 We discuss what it means to be an assertive woman and how it positively impacts your daughter. Why write the book on being assertive? In her clinical practice noticed young women didn’t know what to be assertiveness about, so wrote a five step process to assist women. What is attachment theory and how it impacts assertiveness?